A new logo and monogram are being unveiled as part of the British brand’s new identity under chief creative officer Riccardo Tisci. 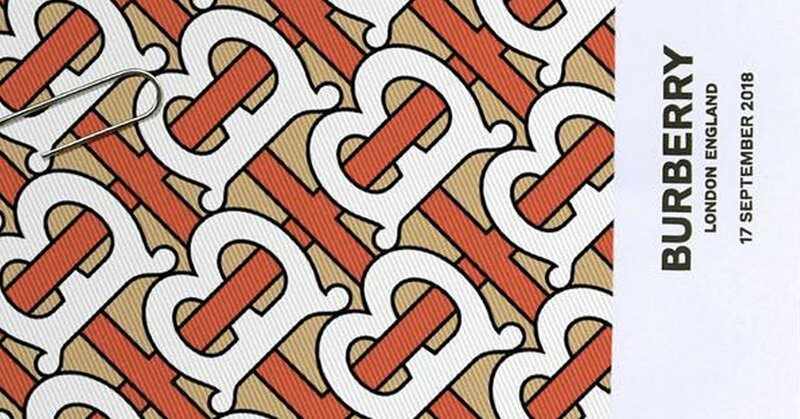 The British megabrand’s chief creative officer Riccardo Tisci took to his personal Instagram Stories to unveil a new logo and monogram — the founder Thomas Burberry’s initials ‘TB’ interlocked across a honeyed background — on Thursday. It marks the first time the brand has changed its logo in almost 20 years (the previous logo, which saw Burberry drop the ‘S’ from its name, was designed by Fabien Baron in 1999). Developed in collaboration with the renowned British art director and graphic designer Peter Saville — best known for his New Order and Joy Division record sleeves, and more recently, his work for Calvin Klein under Raf Simons — the brand’s new logo was inspired by Tisci’s visit to the house’s archive, “especially a logo from 1908 and a Thomas Burberry monogram,” according to an email correspondence between the two creatives, which Tisci shared on social media. The logo and monogram print will appear across all Burberry channels and in a new advertising campaign today. This entry was posted in Latest News and tagged burberry, Riccardo Tisci. Bookmark the permalink.